This is an activity that is currently a favourite at our house at the moment! Its not totally free but I do believe it is a cost effective activity that includes lots of learning and follow up activities. After they were finished painting they were able to choose a plant to put in the pot, this day was getting better and better! 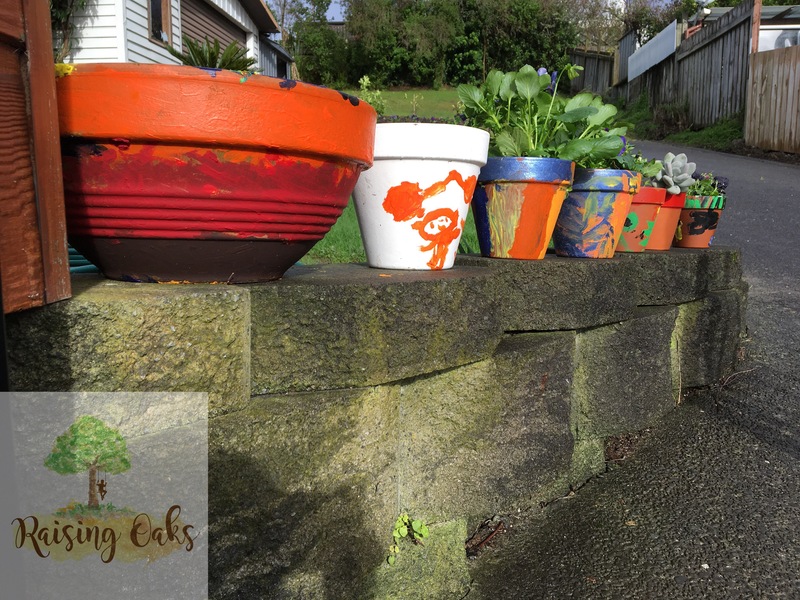 Days later the boys were still talking about it so we decided to do our own version of painting pots at home, they were able to hone their artistic skills and create even better designs. Now we have a wall of painted pots, some still need plants as I cannot keep up with these artistic boys. I am so impressed by their determination and attention span of sticking to the task until it is finished and am thinking if we keep this art activity going we could start on our christmas presents for the grandparents! Terracotta pots are the most cost effective and I think they look the best painted. These pots cost me under $2 each! Let your children select potted colour for their pots these should grow best in potted conditions.